Oktoberfest is an annual beer festival that originated in Germany. They celebrate with beer, food, music and other festivities. The only thing missing from Oktoberfest is soap! That’s how we’re celebrating Oktoberfest this year. Enjoy our variation of the black and tan drink (traditionally, it’s Guinness and a Pale Ale beer layered in the glass) soap made with real beer, scented with the delicious Oatmeal Stout fragrance oil blended with a little Almond Biscotti. You’re going to love this Fall blend. 275 ml dark beer and 139 ml distilled water (mixed together). Buy everything you need in the click of a button (beer not included). PREP: The first step to a successful beer soap (in my opinion) is boiling the beer. In the past I’ve let the beer sit out for 24 hours so it goes flat. I’ve now discovered that you can boil a freshly opened beer ( it will go flat as it’s heated). Boil for 5-10 minutes to cook out all of the alcohol. The beer really ‘poofs’ up during this boiling phase so don’t leave it unattended. For this project I boiled a 12 oz bottle of beer. Due to evaporation, I ended up with 9.29 ounces (which is 275 ml). Let the beer cool back down to room temperature before you get started. Note: The combination of beer and lye has a distinctly strange smell (I don’t mind it but I can see how some might not like the scent). This will go away as the soap cures. FRAGRANCE BLEND: Mix 3 oz of Oatmeal Stout Fragrance Oil and 1 oz of Almond Biscotti Fragrance Oil for a delicious, Fall blend. SAFETY UP! Goggles on. Gloves on. Kids out of the way. No pets around. 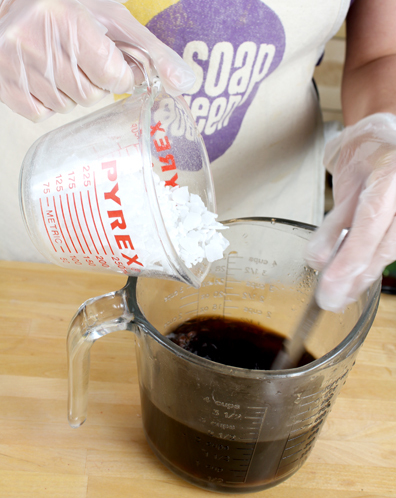 For more cold process safety tips watch the video on Soap Queen TV about lye safety! ONE: By volume, measure out 275 ml (about 9.2 ounces. ish) of your choice of dark beer. Combine the beer with 139 ml (4.7 oz. ish) distilled water. Mix together. TWO: Measure out your lye (by weight) and slowly add the lye to the beer and water combination in 3 batches (pour a little lye and stir – repeat 2 more times). The reason we add the lye slowly is because it tends to roil and boil over if you add the lye to the beer too quickly (even if the beer is flat). Repeat until the lye is completely added and stir until the lye is dissolved. Let the lye mixture cool. THREE: While the lye, beer and water combination is cooling, weigh and combine your Coconut Oil, Palm Oil, Olive Oil. Make sure all of the oils are in liquid form so you may need to melt the Coconut and Palm oil in the microwave or on the stove. Although with this heat wave going around the country, you may not need to heat them at all. FOUR: Slowly and carefully add the lye mixture to the oil mixture. I like to run it down the side of my stick blender to avoid air bubbles. Stick blend until light, light, light, trace. Notice how dark the beer lye water made my soap? Wowzers! That’s some dark beer! FIVE: Split the soap batter into two separate batches. I normally eyeball it but you should have about 4 cups in each container (we like glass Pyrex brand). To the first container of soap add 1 heaping tablespoon of Super Pearly White mica. Give it a quick pulse with the stick blender then hand stir the rest of the way. Once the colorant is mixed in, whisk in just 1 oz of your fragrance oil combination. 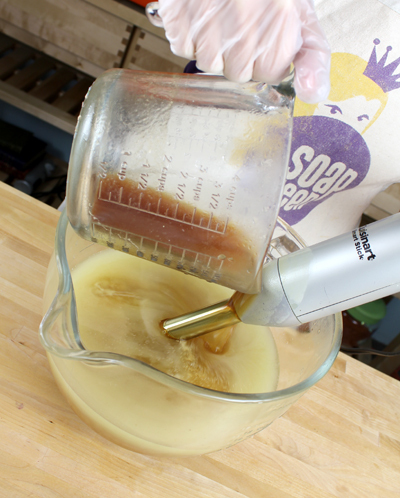 SIX: Whisk in the rest of your fragrance oil combination (3 oz left) to the second batch of uncolored soap batter. Then quickly stick blend for about 10 seconds. SEVEN: Pour each soap batter into their respective sides of the vertical mold. See how the top is all one color in the picture above? I had the tiniest bit of dark soap left over so I just added it to the top. I hate wasting soap! EIGHT: Lift the divider out of its resting spot on the bottom of the soap. Then, twist the divider about 25 degrees and gently pull the divider out. This is going to give us a subtle zig-zag design. Then let the soap harden for 3-4 days before attempting to unmold. I know it seems like a long time but since there’s no oxygen getting to the soap it will take a couple extra days to harden up. NINE: Yay! It’s time to unmold. 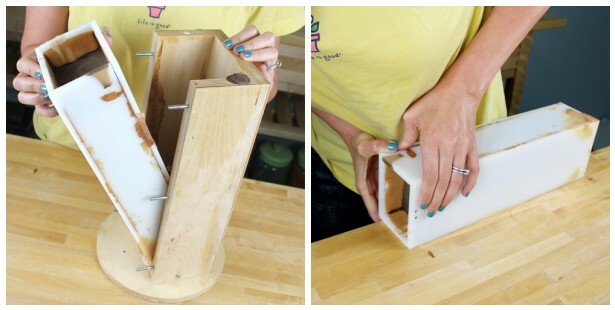 This can be a little difficult because of the design of the mold but it’s well worth the extra effort. I like to put the mold on the side of a counter top and slowly press the sides down. Pressing and sliding the sides off is really important. If you pull them off you’ll take some of the soap with you…not ideal. 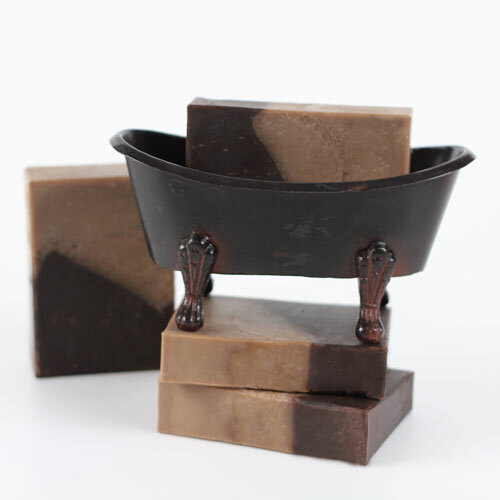 The soap turned out a lovely color that darkened into a perfect Black ‘n’ Tan design over time. The soap got hot so the final bars (if you see them in person) have small titanium dioxide glycerin ‘rivers’ in the soap that adds to the textured look of the bar. So excited to try this recipe! I just ordered the vertical mold and FO’s yesterday and anxiously awaiting their arrival. How sudsy is this soap? My hubby likes lots of lather. Could I add some castor oil to this recipe? If so how would I go about figuring the amount? Would adding castor oil to it effect the acceleration of trace? loved this idea so I gave it a try my first time with beer. Followed your idea of pouring with my own recipe and round molds. Hubby warned it would bleed through one side to the other and sure enough it did. I was bummed but I’ll see what the outcome is when I remove from mold. Guess next time I’ll use my loaf mold though I won’t get the zig or zag 😉 Thanks for the idea! 275 ml dark beer and 139 ml distilled water (mixed together) By Volume. When I run this through your lye calculator at 4% superfat, I get the above 6.5 oz of lye, but 14.82 oz of liquid. That’s almost 1 oz difference. Is this because this recipe calls for liquids by volume? With all the coconut & palm oil, this looks like a really hard bar of soap. Looking at the comments on this soap, several people had difficulties with it – would it be easier to work with (set up slower) if I replaced some of the palm oil with something less hard? Water discounting will make any batch of soap accelerate slightly faster, but I’d suggest adding that extra 1 ounce of water so that you have enough time to work with this fun design and you aren’t rushed. The water is a range and is isn’t as important as getting the exact lye amounts. If you want to increase your working time on this recipe, I’d suggest increasing the Olive Oil amount and decreasing the Palm Oil, or even increasing the superfat. Doing both of those will give you much more time to play around with this recipe. Just make sure if you change any of the amounts to run it through the lye calculator again. I had so much fun using my vertical mold for this!! The soap sold out lightning fast!! I’ll be making lots more for a cowboy event I have in March!! Can you make this using the basic soap recipe from the BB website? The basic recipe is going to be a bit softer (with the higher amount of Olive Oil), but you could use it and add in the beer mixture. Be sure to run your recipe through the lye calculator again to make sure you have the correct amounts for the lye and liquid amounts. I attempted this soap twice; the first time, the mixture was so thick, it just glopped into the mold and I didn’t know that I should have tapped it to get rid of air bubbles. The second time, the soap was much like you show above, but I the divider would not stay put and I had mixture leak underneath and out of the mold. Do you know what I might have done wrong? I ended up just putting it into a loaf mold and swirled it. Ugh. That sounds so frustrating, I’m sorry you are having such a hard time with this recipe. I’d love to help your troubleshoot what happened with your mold. It sounds like your base on your mold may have been flipped over to the flat side of your divider. When you are using it, the one side of the flat bottom divider has a notch, and the other side is flat and won’t keep the divider in place. This soap looks so wonderful! How moisturizing is this recipe? Does the beer add any to it? I’m writing an order list right now so I can make this beauty! P.S. Can’t wait to hear how yours turns out. Keep us updated! how long do you let the bars cure for? I purchased the vertical mold just to make this…it is on my “cure rack” as we speak…it’s been there for about two weeks and the colors turned out great and I can’t get enough of the smell!However, I experienced an issue when pouring into the mold and that is that the divider didn’t keep my soap on one side and it ended up filling both sides I one time. I was able to salvage some and have some bars with the zig zag line and then some solid ones. I thought I would try again and did so last night, making sure that I had everything together correctly, etc…and the same thing happened. Any suggestions? Thanks! I’ve obsessed making sure the middle piece is in the groove…I’ll call upon my core next time and pour both sides at once. I did this soap a couple weeks ago and boy does it smell good. I didn’t get quite enough pearly white mica in the one half (so it’s more med. brown & black). But still looks good. I bought the vertical mold just to do this soap. 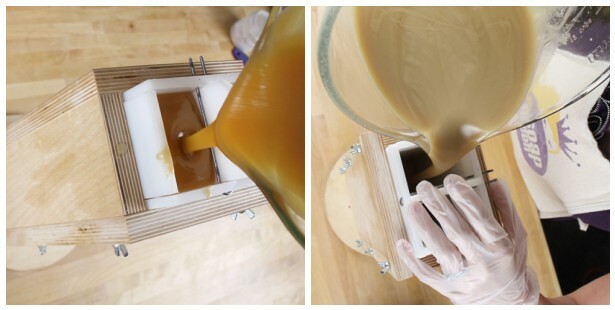 I’m going to make my second batch of beer soap tomorrow with 100% beer to see if it will get any darker! It’s nearly a month since I made the soap (with Guinness stout) but the darker portion of the soap still looks the same – a chocolatey Ovaltine sort of colour. Hi Anne-Marie, I made the beer soap according to the instructions and am very excited about how it will turn out. It’s been about two weeks since I put it on the shelf to cure and although the colour has darkened a bit, how long would it take to look like yours? And if I wanted to reduce the quantity of the ingredients to fit into a 1L mould, would it work if I reduced the amount by half? I’m so glad you like the recipe! It took about 2 weeks to fully discolor to our beautiful black and tan. We cut it right away and got it on the curing rack. Your soap still may get darker by the end of the curing time. You can reduce the recipe by half but still run it through the lye calculator just to be on the safe side. Can you tell me where you purchase all of your great glassware? I love your giant mixing bowls, especially the large one you are pouring from. What degree do you like to use for the lye/water and the oils for this recipe? I’ve never done beer before but am eager to try it. Do you have a list of suggestions on fragrances and essential oils that would work well with beer? I definitely want to try your oatmeal stout. But what else works? Ann-Marie! when i measure the liquid by volume, do i just eye ball it? not necessary to put the measuring cup on the scale? A-M, I love your Black and Tan! But I make Beer soap with all Beer, No water. Boil the beer, freeze it and use it by weight instead of the water. Beer soap has improved my skin so much…love it!!! I love beer soap! I do it with 100% beer sometimes and sometimes a mix. In this case, I was worried about the color of 100% beer going too dark for my ‘light’ side. Have you seen this other beer project I did? Wondering what the “glycerin rivers” refers to. Can you explain this a bit more please? Glycerin is a by product of the soap. If the soap gets too hot it can create little rivers with the glycerin. Just a temperature issue that creates a different texture in your soap (if you look closely you can see it in the pictures). Whenever I tell people I do some MAN products… they start asking me whether they smell of things like kebabs and beer… anyway, starting to think about beer as an ingredient, I’m actually thinking of incorporating it into a shampoo bar, as I know it’s a great ingredient for hair. Yours look great! I’m feeling suitably inspired. The added advantage to using beer in soap, is that once you add what you need, you get to polish off the rest of the bottle! EXACTLY! I like the way you think Magia. We clearly need to start soaping after 5 p.m. instead of during the day (ha ha). Yes, beer soap would be a great hair bar for sure. I love it. Beautiful colours. It seems to be creamy ! Can you do this with wine? Was thinking the same thing 🙂 What fragrance would you recommend to use with wine? Those would make great fragrances! eine wunderschöne, natürliche Seife, doch das Bier trinke ich lieber extra. This is a wonderful idea! I just finished my second batch of beer soap and this recipe will be a great addition to my product line. Thanks for all your inspiring projects! I hope you get a chance to try the recipe. 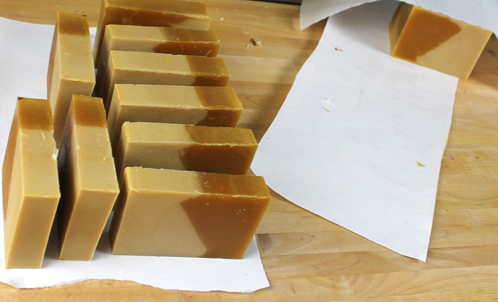 It’s the perfect time of year to power our your beer soap batches! I love making soap with Guinness Stout. My most recent batch was done with the Hot Process method. I chilled the stout for several days in the fridge and made sure it was flat before slowly adding the lye. I will try the boiling method next time – sounds easier and faster. The batch was scented with BB Oatmeal Stout FO. I filled loaf molds almost full and the next day made some plain soap to layer on top. Wowee!!! The scent fills my soap kitchen and I know that this will be a great seller. Thank you Anne-Marie for all of your awesome ideas and for BB. Mmmm. Our soap lab was filled with Oatmeal Stout too. Such a yummy fragrance oil. I loved walking by the lab when that soap was curing. We’ll have to try Guinness in our soap soon. Your soap sounds so wonderful! What a good looking soap for autumn! The zig-zag is a nice twist! This sounds like a great project. Have you tried non alcoholic beer in a batch? We’ve never tried non alcoholic beer but I would treat it the same way. There’s a little bit of alcohol in “non alcoholic” beer so you’ll still want to boil it before adding the lye. So now my question as always, how can I do this with re-batch? Or can I? Hmm maybe with Hops that might work. Definitely! You can add any liquid you want to your rebatch base. Some just add oils but I think beer would be a great addition! Give it a try and let us know how it turns out. I am going to have to try this one for sure. A-M that glass mixing bowl is so big (and nice), I don’t know how you handle it when pouring. Where can you find one like that….love it. That big mixing bowl is actually the mixing bowl from our kitchen aid mixer. We use it all the time. It’s super wide and big enough for a 5 pound batch. So pretty and the FO smells wonderful…in my head. I made my first batch of beer soap a few months ago and it immediately sold out. Made more. Sold out. Used clove EO and tiny bit of cassia and wee bit more of Blood orange EO. And of course Guinness, Can’t wait to try your boiling tip ! Wow, this looks awesome! I love how dark and rich looking the soap turned out. And I absolutely love the subtle zig-zag design you made. I recently purchased this mold and have yet to use it, but I wonder what the design would look like if you twisted the middle divider even more – maybe in almost a complete circle. Do you think it would produce a cool “middle swirl” effect? 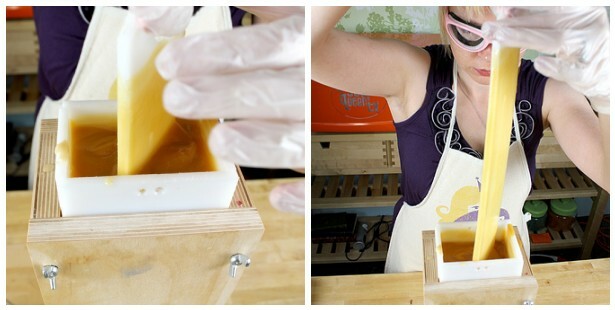 Either way, I love this mold and the soap you made in this tutorial looks so amazing! The soap looks awesome, and I bet it smells just as great, but where oh where did you find that mini bathtub? I collect miniature bathtubs and I must have that one! Beautiful shades of brown. And I love the zig zag you get by just twisting the insert a bit! I’ll have to try that next time I use my vertical mold. I love the way it naturally discolored too. And there are so many different designs you can do with the vertical mold. I love the subtle zig-zag in the design …it adds just a little something extra. This looks so yummy! Just in time for fall weather. Yes, that’s what Anne-Marie did. Mix the beer with 139 ml of distilled water (which is roughly 4.7 ounces). I hope you give the recipe a try. The fragrance combination is soooo yummy. I can’t get enough of it!